Nick Mathews (left), the oceanographic technical services manager at BIOS, gives instructions to crew and scientists on the deck of the R/V Atlantic Explorer during the deployment of the Multiple Opening/Closing Net and Environmental Sensing System (or MOCNESS) on a recent BIOS-SCOPE cruise. 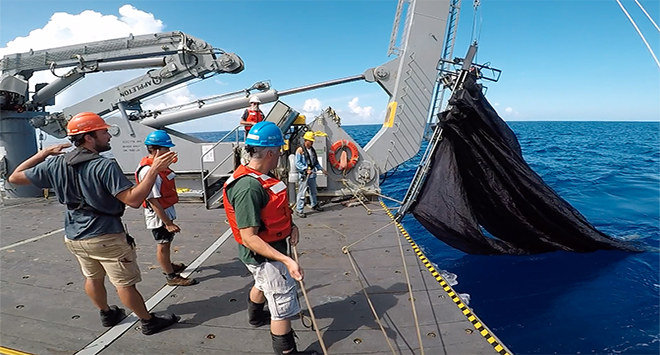 The system, comprising nine nets that are towed through the water and opened and closed at various depths, is a critical tool in helping researchers answer questions related to the diversity of zooplankton and their role at the base of the marine ecosystem. Nick Mathews spent three years as a marine technician, enjoying months at sea and working 12-hour days aboard the BIOS-operated research vessel Atlantic Explorer, when he jumped at the opportunity to become a manager. Mathews, now 28, oversees a crew of three technicians and helps to develop budgets, write grants, and make sure the ship is ready for the hundreds of days it spends at sea each year for science. When he is not at BIOS or sailing on the Atlantic Explorer, he can be found living on his 30-foot sailboat Night Owl, moored at Stokes Point. How did you become interested in working at sea? Mathews: I grew up far from the ocean, in suburban Pennsylvania, and my exposure to the ocean was limited to family vacations and school field trips. I attended Kutztown University, near my hometown of Reading. I didn’t have a declared major in college, and leaned toward becoming an engineer. While fishing around for solid footing I took classes that interested me, including astronomy. I impressed my astronomy instructor one day because I knew the answer to a difficult math question, which I knew only because I saw it on the science channel the night before. I started hanging around her office asking more astronomy questions, but since she was busy, she sent me to hang out with the oceanography professor. I had preconceived notions about oceanography and I told this professor, “I’m not really into Sea World or dolphins or anything like that but nice to meet you.” She set me straight about oceanography and about the research she did with NASA and beach erosion and other areas of hard science. Within a year I declared my major in oceanography and this professor, who had become my advisor, invited me on a six-week research cruise near the Mariana Trench (the deepest ocean trench in the world) aboard the research vessel Thomas G. Thompson. I sailed with a team of robotics engineers from Woods Hole Oceanographic Institution (WHOI). I was completely sold on oceanography. All I wanted to do after that was fieldwork and research on ships, and this inspired me to become a marine technician. What is the journey to becoming a marine technician? After graduating from Kutztown in 2013, I spent six months at sea, sailing from Hawaii to New Zealand, on various vessels as a MATE (Marine Advanced Technology Education) intern. MATE internships focus on technology and scientific support of marine research rather than the academic research. Interns work as marine technicians aboard sea-going research vessels that are part of the University-National Oceanographic Laboratory System. Following my internship, I was offered my first job on the research vessel Knorr at WHOI. When that ship was retired in 2014, I used my connections from my internship to ask about jobs at BIOS. 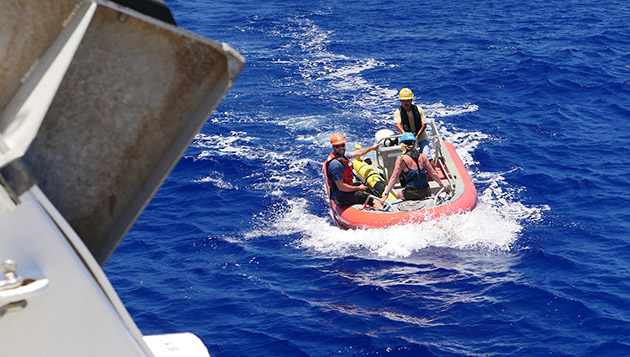 Mathews (left) and marine technician Jillon McGreal (center, blue hard hat) return one of the Mid-Atlantic Glider Initiative and Collaboration (MAGIC) Lab's gliders to the R/V Atlantic Explorer after a routine deployment. How did you land in the role of manager? I had been working as a marine tech on the ship for almost three years and I had been promoted once or twice. Justin Smith, my manager, resigned and since I had been here the longest, I was put into the tech manager position in the interim. In October 2017, I received the permanent position. I hired two more marine technicians who were able to go out on the Atlantic Explorer. That allowed me to stay on shore more often and learn more responsibilities as a manager, which includes writing grant proposals and developing budgets. What experiences have you had as a technician or manager that stand out to you? Periodically research vessels go into what we call “shipyard periods” for a month or more of maintenance and overhaul of equipment. In my new role as manager I have been able to make an impact on the physical set up of the ship, such as rewiring the network for the entire vessel and installing sensors that gauge a variety of measurements, from the sea surface temperature to levels of chlorophyll. After spending more than 500 days on a variety of research vessels throughout my career, I like how I’m now able to influence the greater vision of how ships are operated to advance science research.